On Saturday I purchased this brilliant cushion from Rory Dobner. I have wanted one for ages, but they always seemed to be sold out! Now it’s winging its way to me and I am pleased as punch. It will make a brilliant focal point in my bedroom – it’s very Alice in Wonderland don’t you think? It was very expensive, but I get a permanent 20% discount at Liberty Online (see below). The total price was still rather dear, but it’s very much a collector’s item and I really think that it will be a bit of a showpiece. 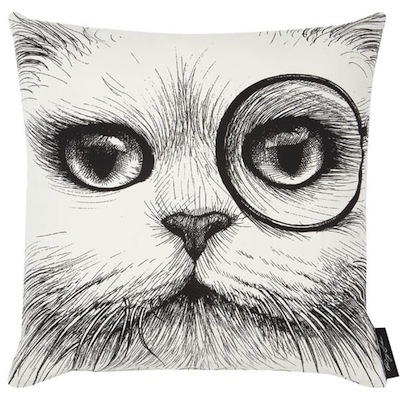 Rory Dobner Monocle Cat Cushion is at Liberty Online HERE – pop it on your Christmas Wishlist!